Find how much concrete weighs by entering the volume below. Use our concrete calculator to find the volume of concrete. 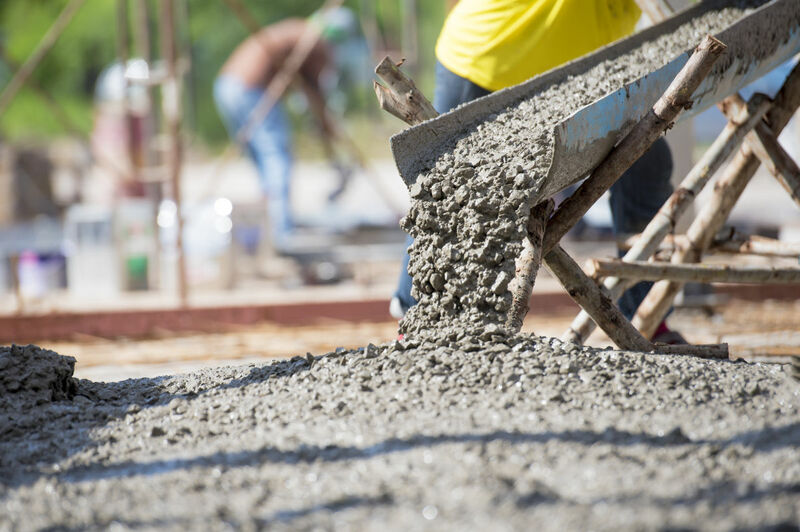 A typical concrete mix weighs 150 lbs per cubic foot, 4,050 lbs per cubic yard, or 2,400 kg per cubic meter. The weight of concrete is determined by its density, which can vary based on the amount of aggregate, water, and air in the mix. The density of concrete is 3.15 g/cm3 while the density of aggregate will vary by the type of stone used. For instance, gravel has a much higher density than vermiculite. The density of a typical concrete mix is 2.4 g/cm3 or 150 lbs/ft3. Different mixes of concrete will use more or less aggregate as well. For instance, the preferred concrete mix for a countertop will have less aggregate than the mix for a driveway, which will affect the density and thus the weight of the concrete. The density of concrete is determined by mass and volume, since density is know the formula for mass can be changed by multiplying the density by the volume. Also check our our water weight calculator. Use our masonry calculators and expert-written articles to plan your next concrete or masonry project. Calculate material for concrete steps or stairs by entering the stair width, rise, run, and number of stairs. Get a concrete cost estimate for the project.